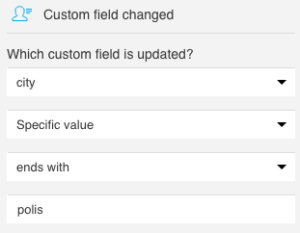 The Custom field changed condition triggers an action when you or your contacts update a given custom field. It works with predefined custom fields as well as the ones you’ve created in your account. You can use any custom fields formats–single choice, multiselect, and text–with this condition. The element has an “if yes” (green) and “if no” (red) connector. If the custom field changes for your contacts, they are affected by the action you’ve connected to the “if yes” connector. Contacts with no changes to the custom field move down the path to the action you linked to the “if no” connector. Note: When you use Custom field changed as a start element, link the next element only to the “if yes” connector. Only the contacts who have the new custom field can “enter” this element at the beginning of a workflow, so the “if no” connector simply can’t trigger any action. How do I set up the custom field condition? If you’d like to create a new custom field, you can do this under Contacts>>Add Custom Field (you can also use a shortcut to get there). You can’t add or create new custom fields in marketing automation. Select Any value when it’s only important to you that the value has changed, not what the change is. 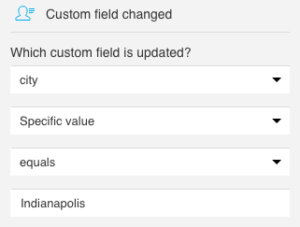 The condition triggers an action for any changes to the custom field value. Select Specific value if you want the condition to trigger an action when only a specific change occurs. When you select this option, you additionally need to Select the action and Enter a value from drop-down list. The action and value of the condition depend on what type of Specific value you’ve chosen. Each drop-down menu contains prompts that help you set them up. The condition properties can be very specific. Here, the condition triggers an action when your contacts set or update their city to Indianapolis in their contact information on your site. This way you can target contacts who’ve recently relocated to the Midwest (Minneapolis and Indianapolis), or perhaps moved to other parts of the world and are now in Annapolis, Demopolis, or Heliopolis. 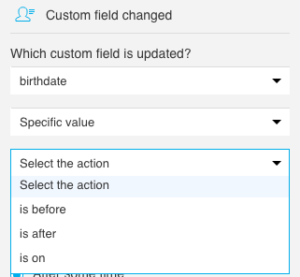 If you select a date-based custom field, you can go with one of the three options: is before, is after and is on. Choose the setting that lets you reach the right group of people with a well-timed message or other action. How do I change custom fields for the condition to work? The contacts’ custom fields can change in another workflow. You can also assign new custom fields in Search Contacts. Your contacts can change custom fields when they update their contact information using the “change your contact details” link in a newsletter. When importing contacts, you can update custom fields for those contacts who were previously added to your Contact List. The Custom field changed condition doesn’t work for contacts who received a given custom field before a workflow is on, or before they “reach” that element within a workflow.